The idea is to fabricate using 3D printing technology, I believe they are using resin based. 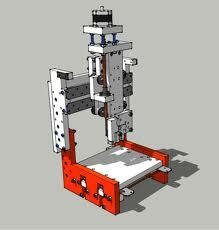 The machine's head and platform is shown while the process of printing the object was demonstrated in fast motion and appears similar to the objet printer. Generally, the resin that is used for stereolithography machines can be obtained optically clear, but the models would need to be built up using various resins, differing in color and opacity to be really rich in appearance and function. It is apparent that, at least one of the models is painted, so the internal optically clear functional part is obscured. The model I am referring to is the blue character with horns and the eyes are animated from the internal optics and the light source shining from the bottom. There are many possibilities and applications for this method, many are shown, that could really open up areas of interactive devices. One that I enjoyed was the chess table, showing a lit representation of the position.